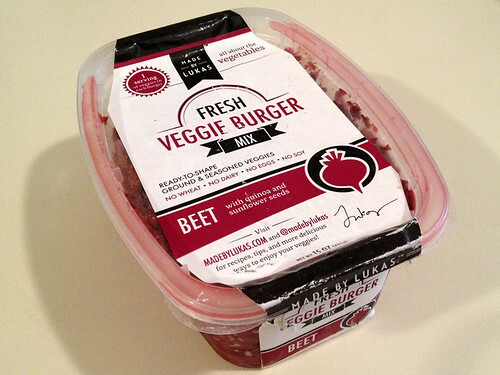 I’ve tried a lot of refrigerated and frozen veggie burgers, and even veggie burgers made from a dry powdered mix before – but I’ve never tried veggie burgers made from a refrigerated vegetable mix, so I was excited to add this Made By Lukas beet vegetable burger mix to my shopping basket. The instructions said simply to “shape into 4 patties” – I was only cooking for myself, so I just made one (planning to eat the others in the next couple days, or shape them and freeze them if I need to keep them for longer). Wary of how the fresh beets might stain my hands, I wore latex gloves for this part. 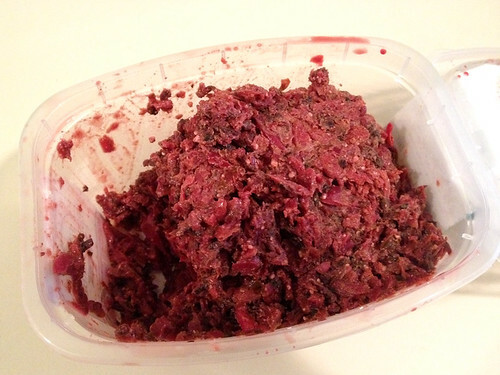 If you didn’t know that was a vegan mixture of beets, cabbage, quinoa, and sunflower seeds, wouldn’t you think it kind of looks like raw meat? The mix is very soft, but once it fried for a few minutes on one side it was not difficult to keep it in one piece when I flipped it over with a spatula. I let it cook the full 4-6 minutes per side that the instructions recommended, but even fully cooked it was still quite soft. 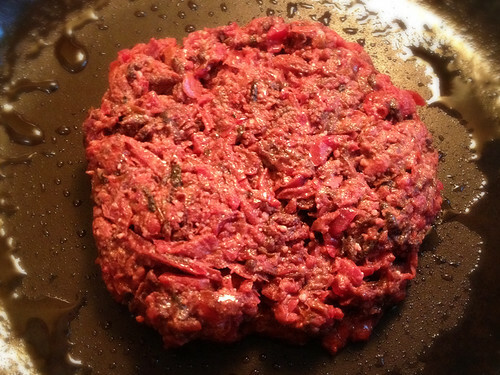 Beets are one of what I consider the secret ingredients for a great veggie burger – they add color that fools even meat-eaters, and they have a great hearty flavor. That said, I also enjoy beets on their own and in various other recipes. 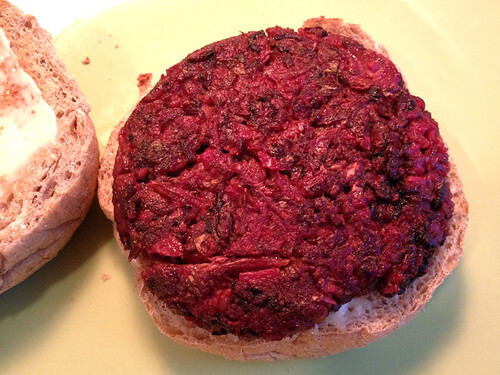 But unlike other veggie burgers I’ve had in the past which contain this great ingredient in smaller amounts, the beet flavor is VERY prominent and unavoidable in these burgers. So while I’ve urged beet-haters to try other veggie burgers despite their misgivings about the bright red-pink ingredient, I would caution only beet-lovers to sample these ones! Beets are not the only ingredient, but they are the most prominent flavor. 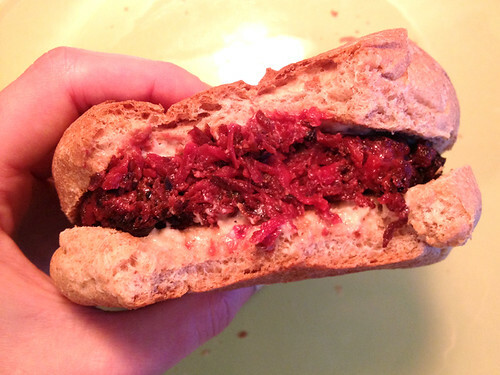 For beet-lovers, though, the taste of these patties is quite delicious! The only topping I put on my burger was a tiny bit of mayo, but I probably could have even done without that because the patty was so moist and flavorful on its own - and quite hearty and filling. But eating it felt more like eating a vegan Sloppy-Joe than a burger. The patty was so soft, even after being fried on both sides, that it just mushed in my mouth like a shredded beet salad on a bun. The bun held it all inside okay, but the patty would not have kept its shape at all on its own. It was tasty, without a doubt, but quite a different experience from eating a “normal” veggie burger. The Whole Foods location where I found this mix also had a carrot-parsnip flavor, which I was tempted by (because I love parsnips and think they are a very underrated vegetable!) – and the Made By Lukas website shows that they also offer a kale flavor, which is probably equally delicious. And they’re all completely vegan, dairy-free, gluten-free, and soy-free! This is probably the closest you can get to home-made without taking the time to measure and mix all those ingredients together on your own - so it's a great quick and easy option for a meal.